I searched and couldn't find anything quite like this. There are things I find that are by no means "the best thing I've eaten," but are still interesting and/or tasty and/or unusual enough that I'd like to share them. So I thought I'd start a thread for sharing stuff one runs across that doesn't warrant its own thread but also doesn't fit in a "best" list. On the way home from a speaking engagement, as I was on Oakton, my car steered itself into Super H Mart. I got the stuff I usually buy, but I always try to pick up at least one or two things I've never tried before. Today's discoveries were from the snack aisle. Elena's Original LAPID Fried Chicken Skin Chicharon was bound to catch my eye. Not as good as hot, fresh, grilled chicken skin in a Japanese restaurant, but this was in a package that could be taken home. It is very crunchy but softer than fried pork skin. Seasoned with garlic, chili pepper, cayenne pepper, and black pepper, it has a kick. It's so rich, two or three pieces were all I could manage. But I thought it was fun and tasty and worth mentioning, even if not in the "best thing I've eaten" category. Also tasty: Boy Bawang Cornick_ Lechon Manok Flavor. The picture on the bag included an ear of sweet corn, a roast chicken, and a cartoon garlic bulb, which told me all I really needed to know. Because this snack is made with sweet corn, while it's still crunchy, it's not the tooth-breaker that Corn Nuts can be, while also being sweeter. Again, not a "best of," but tasty and crunchy -- and the sort of thing I like to take to parties if asked to bring snacks, rather than more ordinary stuff. I'm hoping others have discovered interesting products that they'd like to tell us about. Exploring is fun, but having a guide is never a bad thing. Last edited by Cynthia on April 6th, 2016, 12:57 pm, edited 1 time in total. Today's discovery: English farmhouse cheddar with caramelized onions at Trader Joe's. Yum. Good idea for a thread! I'll play! Swanson's broths has several new 'flavors' including Chinese Hot and Sour broth, Tuscan chicken broth and some kind of Thai broth. We have tried the Hot and Sour broth recipe and liked it -- and even better the next day. You need some shitake mushrooms, bamboo shoots, tofu and an egg. We added a cup or two extra water more than the recipe called for. But it was dead easy to make. The family liked it a lot. I liked it but it tasted a bit too gingery to me the first day, much better second day. This soup really surprised everybody. We're ready to make it again to use up the leftover half can of bamboo shoots and half package of tofu. Today I made the Tuscan Chicken soup. Added ingredients: Italian chicken sausage which it turns out needs to be raw so you can peel off the casing and brown it in pieces (Have you ever seen chicken sausage like this? I used Italian sausage from Smeissers -- pork), kale (small package of baby kale --only needed half), an onion, can of cannellini beans and half a cup of white wine. This is a winner and again, really easy and fast to make. Serve it with red pepper flakes, real parmesan cheese a drizzle of olive oil. The Thai stock calls for a can of coconut milk etc. I will post after we try it out. Thanks, Joy. That sounds like a lot of fun. I'll have to keep an eye out for those. I've made green curry soup several times with a carton of the Swanson Thai ginger broth + a can of coconut milk + either a pouch of Campbell's green curry skillet sauce or some green curry paste + vegetables and sometimes chicken. I guess it could be any Thai curry variety depending on the paste you have on hand; it's just the Campbell's sauce that makes it a green curry. Lately I always have a carton of the Swanson Thai ginger broth in the cupboard. Joy: there is raw chicken sausage house made at many Whole Foods, definitely at the Lincoln Park location. I would have been very skeptical of those swanson broths but appreciate this advice! Hi Joy- You might also try Mariano's for the raw chicken sausage. I know both of the Whole Foods in Evanston carry them too. Made pork slab ribs and chicken in the ugly drum smoker ala Low&Slow Gary style, wanted a side dish kinda like a cole slaw but didn't want deli case slaw. I'm a sucker for jarred vegetables. 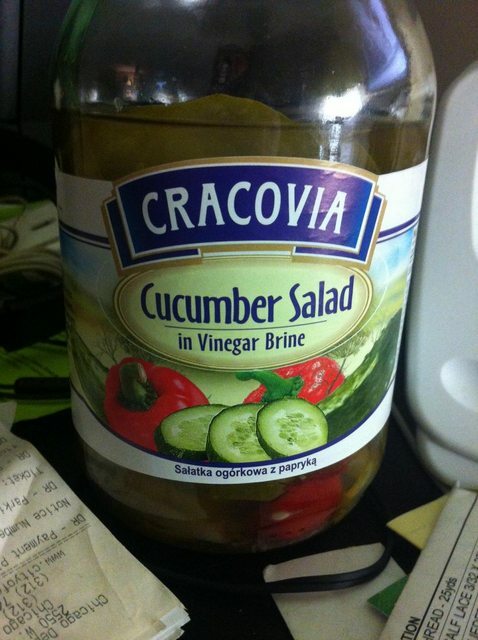 Tried a new one to me: Cracovia Cucumber Salad. It was perfect. the brine in the jar isn't sweet like pickles nor was it overly salty. It's very cucumberly. I love this idea for a thread. So many items disappear off our stores' shelves; it is nice to discover new products share-worthy. In exploring one Saturday afternoon at H-Mart, I found Chex Mix "Simply Chex"/Cheddar Flavor. I used to be able to find these at Dominick's, but alas...who would have thunk, a visit to an Asian mart would have yielded a favorite snack of my children's younger years. I often wish I could get someone to guide me thru H-Mart as the majority of items on their shelves area mystery to me. Thanks for sharing your finds Cathy! Andouille and Tasso from Gepperths is fantastic and did wonders for my gumbo. So did the smoked pork hock from Peoria meat market, which is something I'll continue to add when I make stock. I also used smoked turkey neck and turkey wing from Peoria to make amazing braised collard and mustard greens, also picked up at Peoria. Because I have a number of friends who are either celiacs or have wheat allergies, I'm usually on the lookout for gluten-free alternatives. So far, Hodson Mills's brown rice and flax is my favorite non-wheat spaghetti, but this weekend, at Garden Fresh in Buffalo Grove, I discovered a new line of gluten-free pastas that seemed worth testing -- Explore Asian. They have a few varieties, but I picked the organic adzuki bean spaghetti. Tried it tonight, and I think it would do better replacing soba noodles than real pasta. But it's tasty, the noodles hold together (which doesn't always happen with non-wheat noodles), with a nice al dente texture -- but its most impressive feature may be that a single serving offers 20 grams of protein and 15 grams of fiber. So pasta for those who seek protein, not just for those avoiding wheat. Jilter - I also like to look at H-Mart for something new every time. But I agree it is hard to figure out what you are looking at sometimes. I have discovered their house-made tofu tho, which is delicious. Thanks for the chicken sausage suggestions, annak and NFriday! I have always just bought the stuff that comes in a package like hot dogs. It might be time for me to step up my game! Katie, where have you found that Campbell's green curry skillet sauce? We like to keep the sesame skillet sauce on hand. We like to slice a small pork tenderloin into nice medallions and dust them with corn starch, sauté on both sides in some neutral oil, and then add the sesame skillet sauce. To make it "fancy" I sprinkle more plain sesame seeds on top and scatter some thinly sliced green onion. Rice, some simple stir-fry veggies and dinner is done for a busy Tuesday night. Kenji -- we are big fans of pickled vegetables and fermented vegetables. I am now on the hunt for that gorgeous jar of Crakovia cucumbers. Yesterday I found that Jerry's carries Krakow brand which is NOT the same. I can't think of where to find the Crakovia line. Can you tell where you found it? I am thinking it is some nice ethnic market. There's always a giant display (or several) at Fresh Farms near the registers. They have a large selection of Kinder chocolates. Family Fruit Market (4118 N. Cicero in Chicago) carries the Cracovia brand, if I'm not mistaken. bfolds wrote: Family Fruit Market (4118 N. Cicero in Chicago) carries the Cracovia brand, if I'm not mistaken. I would also try the Shop & Save, which took over the Dominick's spot across from Superdawg. They have a huge selection of Polish products. Joy, I regularly see the Campbell's green curry skillet sauce at Jewel. They cost $2. It seems they've got at least a dozen such sauces (in foil packaging) out now: some for skillet sauces, some for oven sauces, and some for use in a slow cooker. The green curry is the only one I've tried yet. kenji wrote: Tried a new one to me: Cracovia Cucumber Salad. It was perfect. the brine in the jar isn't sweet like pickles nor was it overly salty. It's very cucumberly. I spotted this at Mariano's in Harwood Heights this afternoon. I didn't remember Kenji's 'isn't sweet' description but did see sugar on the label and didn't buy any. It is inexpensive at $2.29/jar. I'll pick some up next time. Not really today's discovery, but enjoying it today. I've discovered that almost every country in the world has bouillon cubes/flvor cubes of some sort -- often by Knorr, but not always -- and on those occasions when I simply want a warm cup of something that tastes good, but I'm not really thinking "tea," these can be wonderful. At the moment, I'm sipping Knorr's Tom Yum with a splash of coconut milk in it. Zippy and flavorful. Last night, I warmed up with some "stewed duck" from an Asian company (Vietnamese, picked up on Argyle St.). I always have on hand the mushroom cubes from the Polish food section -- anything with a picture of a mushroom and/or the word "grzybowy" -- it's cepe/porcini flavored -- wonderful. Of course, you can add it to a dish, as well, or toss it in when cooking rice, but when I need an umami hit, a cup of grzybowy broth hits the spot. Just checked the pantry, and I also have a Vietnamese Barbecue Lemon Grass Flavour. As long as the cold, damp weather hangs on, I love having this stuff on hand. And I'm really enjoying my Tom Yum. Yum, indeed. I'm now going to be on the lookout for boullion cubes in ethnic markets. That was not really on my radar screen before reading the post above. Cynthia wrote: Not really today's discovery, but enjoying it today. I've discovered that almost every country in the world has bouillon cubes/flvor cubes of some sort -- often by Knorr, but not always -- and on those occasions when I simply want a warm cup of something that tastes good, but I'm not really thinking "tea," these can be wonderful. I use two other products that I purchased at Woodman's. The first is Por Kwan brand Tom Yum Paste, a product of Thailand. I use that to make Tom Yum and it is great for cleaning the sinuses when you are not feeling well. The second is the Double Golden Fish brand Dau Cach Cua (Crab Paste with Soy Bean Oil). It is another Thai product. Long, long ago, I discovered the bouillion cube dodge. Whenever I travel, I pop into supermarkets and buy cubes. In England, for example, you can find lamb cubes, and their beef cubes taste quite different from ours. France has a whole extended range of cubes, and all of them are first rate. Italy as well. Cynthia justly points to the Polish mushroom cubes, but Germany and Italy also make dynamite--and different--mushroom flavors. Mexican: shrimp cubes. SE Asian: tom yam, as Cynthia notes, but there also are seafood cubes, and the vegetarian and mushroom cubes are different again--the veg cubes show bok choi, and the mushroom cubes cubes are shitake. An easy way to travel, taste-wise! Hot & Spicy is a very accurate description. It's a great condiment, but today, I just added a bit of oil, and it made a great, if fiery, salad dressing without adding anything else. It's got salt, chilies, undefined spices, onion, and garlic. Fun thing to have in the vinegar collection. Purchased at H-Mart, but I imagine it might appear at other places that carry foods from the Philippines. Roasted Coconut Chips at Trader Joe's. Yum. Nueske's liver sausage. Stopped at their Company Store in Wittenberg, WI, on my way home from my recent road trip. Got bacon, of course, and cheese and bacon brats, but the smoked liver sausage was the real revelation. Cynthia wrote: Nueske's liver sausage. Yes! Love it on blackbread with mayo and thinly sliced red onion. Completely addictive. BASIL BREAD at Tel Aviv Bakery on Devon. Round, flat, with olive oil and basil. Picked up a sample from the counter as I paid for their wonderful French Onion Hot Dog Buns. Ate it while walking out to the car. Went back inside and bought a loaf. It’s gone. This place is truly dangerous. Good thing today is Friday or I would be back tomorrow. Hearty dark bread + Nueske's smoked liver pate + thin sliced red onion + sardines (Matiz Gallego in olive oil) = perfect sandwich. Crunchy Garlic Topping from Mitsuwa. Small jar (3.9 oz), distributed by S&B Foods. It's a thick paste of red chilies, sesame oil, onion powder, soy sauce, and a few other seasonings dotted with a good handful of seriously crispy fried garlic. If you've got some hot rice or hot noodles, and you're in a hurry, you don't really need anything else besides this topping. Yum.